The cannon-boring machine adapted by Count Rumford for his heat experiments. The friction as the blunted borer cut into the metal produced enough heat to make the water boil. Mechanical energy was being converted into heat energy. 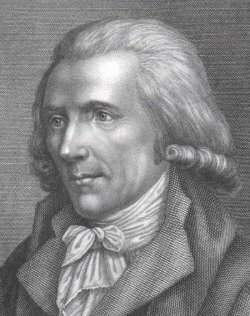 Benjamin Thompson was an Anglo-American physicist, inventor, and politician who was a pioneer in the development of modern ideas about the nature of heat. Thompson, later Count Rumford, was born in Woburn, Massachusetts and had little in the way of formal education. He was a loyalist, and at the start of the American War of Independence he came to Britain, and eventually became Under-Secretary of State in the Ministry for the Colonies. It was about this time that he began his experiments concerning heat. In 1779 he was elected to a fellowship of the Royal Society. Three years later he was knighted by King George III. After the end of the war Thompson went to Bavaria, Germany, and became Minister of War, helping to reorganize the army there. He made such an impression on the Bavarian authorities that he was given the title Count Rumford. Later he returned to England, where he helped to found the Royal Institution (1799). After this he went to live in France, and married the widow of the famous French chemist Antoine Lavoisier. He died in 1814 at Auteuil, at the age of 61. Rumford published the results of his investigations into heat in 1798, in a paper read to the Royal Society. He had been astonished at the amount of heat generated when army cannon were bored, and submitted the process to experiment. If heat were actually a substance, as many scientists of the time believed, it was difficult to see how so much of it could be produced during the boring of a metal cannon. It might be argued that the heat had been stored in the solid block of metal all the time, and was released when the block was broken down during its filings. But Rumford showed that the amount of heat was not related to the quantity of filings produced. The amount of heat – but not the quantity of filings – was greater when a blunt borer was used. In one spectacular experiment Rumford had the barrel of the cannon bored under water, using horses to move the cannon round. To the amazement of the spectators, the water was made to boil, and continued to do so as long as the machining of the metal carried on. The main conclusion reached by Rumford was that heat could not in fact be a material substance, as supposed in the caloric theory, but was the result of the mechanical energy consumed during the boring operation. The idea, held even by such eminent scientists as Lavoisier, that heat might be a chemical element could no longer be accepted. Subsequently, other experimenters, notably James Joule, demonstrated the transformations between other forms of energy.